There is a lot of debate over the frequency that the timing belts should be renewed on a Ferrari. For the record, Ferrari mandate new timing belts every three years for all V8 models (not applicable to cars with the F136 chain driven engine). I have lost count of the times I have heard the argument that normal cars can last 10 years/125,000 miles between changes so a Ferrari shouldn’t be any different. However, in my opinion, there is very good reason for the short interval. Firstly, most Ferraris are driven up to the red line regularly – in a 360 that is 8,500 rpm, which is a hell of a speed for a rubber belt to be travelling. Additionally the flat plane crank configuration, that allows the engine to rev up to such speeds, causes immense out of balance forces and vibrations to occur which do nothing to smooth the path of the belt as it is whizzing around. This environment reduces the lifespan of the belt considerably. The short interval also provides for a thorough check of the hydraulic tensioners, the tensioner bearings and the tensioner arms – none of which can be properly inspected with the belts in place. Finally, the cost of a belt failure is eye watering for even the deepest pockets. Faced with the choice of spending £6-700 every three years or risking an engine rebuild, I know where my money would be. You don’t need to take my word for it though – here’s a video clip that I took yesterday of a 360 cambelt that was overdue. 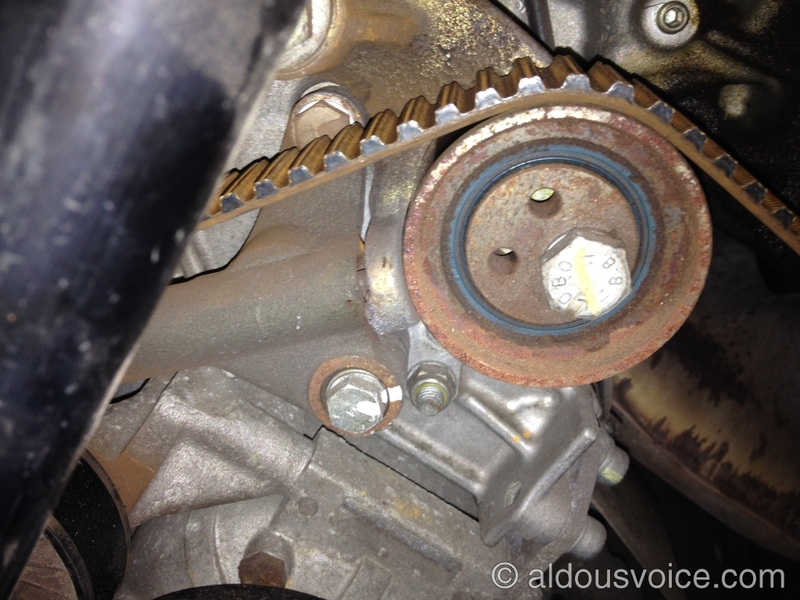 Note that the tensioner is fully extended and the slack is from the stretched belt – there is enough room to completely remove the belt from the pulley. How the belt didn’t jump off I don’t know…. The question is how overdue were these belts? Well the service records indicated a belt change in 2011 which would be just four years and 9,000 miles ago. Given the state, I suspected that this belt service had actually been carried out so I checked the date codes on the belts. 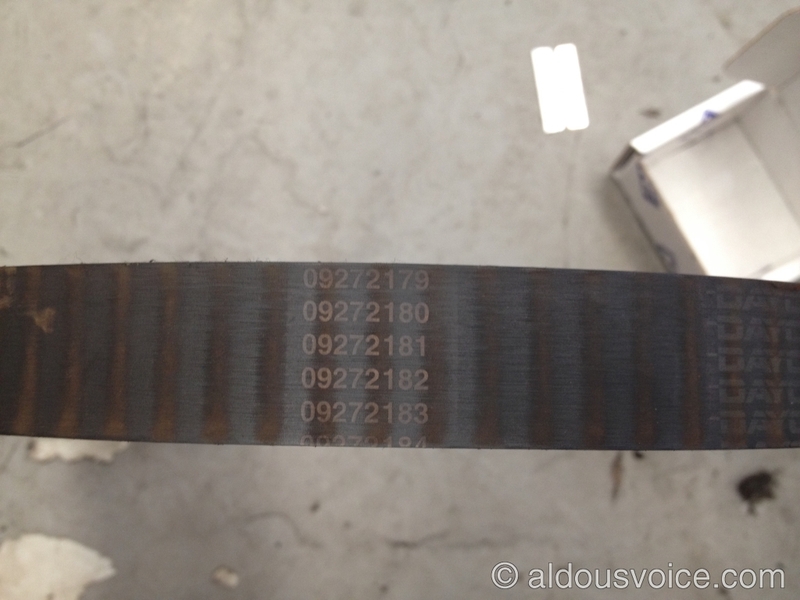 Dayco helpfully stamp a sequential number on the belts to inform the date of manufacture. The first two numbers indicate the year (2009), the next two indicate the week (27th) and the fifth number tells us the day of the week (2nd). This puts the date of manufacture at Tuesday 30th June 2009. For those that are interested, the final three digits on the code represent the position of the belt in the mould. Many belts are moulded in one piece and then chopped up into the thinner end product. It allows the Dayco to track the part of the mould any belt has come from for QC purposes. 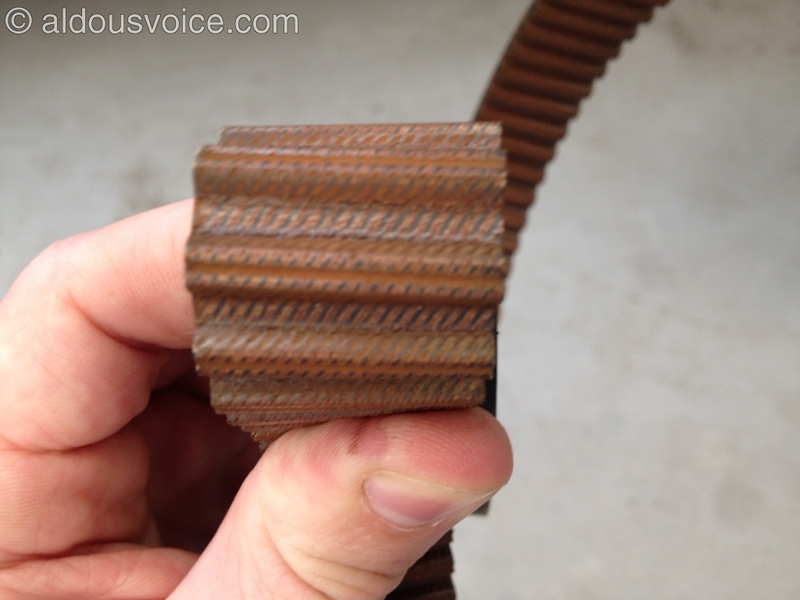 Stretching isn’t the only problem for tired belts as the rubber degrades and cracks. To actually see the cracks properly you need to fold the belt back on itself – something that can’t be done in situ, so the argument that a visual inspection will suffice in place of replacement doesn’t hold water with me. 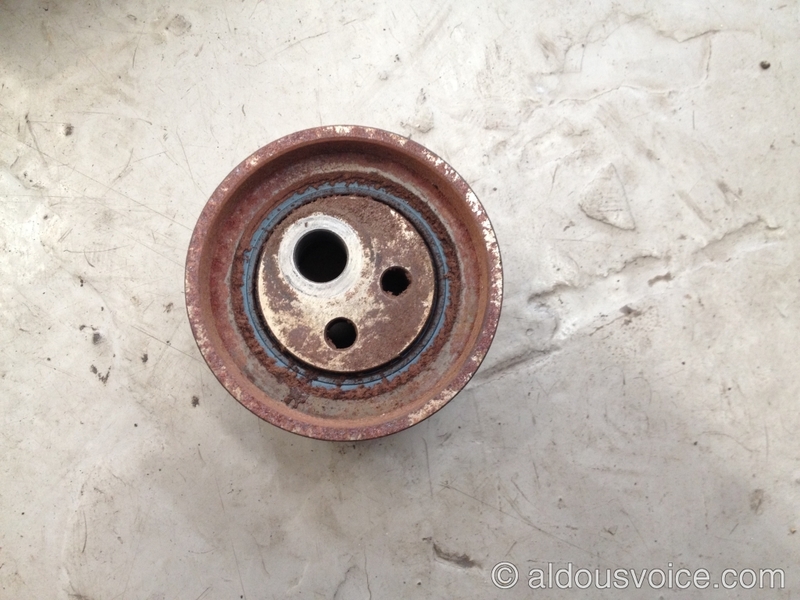 Tensioner bearings should also be considered a consumable item and replaced at the first sign of wear. Just looking at these ones was enough to know they were junk but even visually good bearings had hide rough running and play (both lateral and radial). If a tensioner bearing seizes or collapses then there is a high likelihood the belt will fail or jump a tooth. Note that I recommend using Hill Engineering bearings – not only are they cheaper than OEM but they are of a much higher quality. In my opinion, extending the interval or srimping on bearings is a false economy bordering on madness! Yes great post indeed! The actual belt service really isn’t very expensive when you take into consideration the added insurance it buys you every 3 years! I have heard of cases where the repair bill was $15-$20k from a worn out belt! I agree that it’s a small price to pay, as other things can be checked at the same time, but is it true that in the USA, Ferrari recommend 5 yearly intervals, I read on F-Chat that some guy in California actually waited until the belt was 9 years old! It seems that the chain drive system is much better, but will this bring it’s own issues. I agree that this is a small (fairly) price to pay, but Is it true that in the USA they have a 5 year replacement cycle? Do you think that the move back to chain drive will bring it’s own problems. 5 years is for V12 engines. Interesting question on the chains – time will tell! The additional issue is the extreme heat within the area of the belt and tensioners. The belt suffers from radial heat as well as engine temperature, whilst the tensioners eventually run dry due to a lack of lubrication. Taking the cost aside, once the belts have been replaced the engine timing is improved which gives much better performance. Something we all must crave, no???? Great post for those who do not understand. I’m doing mine at 5 years. The tensioners were.. ? Not tensioning I presume? Ouch! That belt was slacker than grannies suspenders!! Thanks for pointing out the reality. I am always bemused that an external manufacturer can make better items than the factory. Do Ferrari not care that Hills put their reputation to shame? Hi Aldous, I hope you are well. Sorry for posting on a non related article but I couldn’t find a particularly suitable place. My question is in relation to the removal of the cam covers on the 360. I’ll be replacing the gaskets there due to leaks and I’d like to know what I can expect when removing the covers? Will oil pour out or will it be just the case of a few drops? Any idea of the torque values of the bolts there when I retighten?